Figure 1. Menu bar (yellow), toolbar (red), view toolbar (blue) and main view (green). Project: This menu allows to create, open, close, save, upload to download from the cloud or split a project. 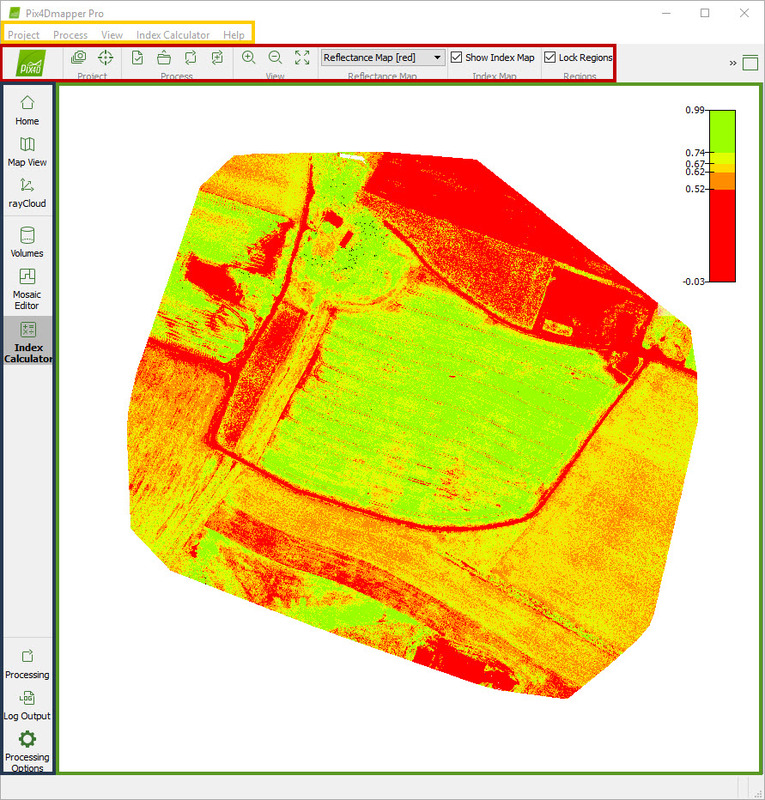 It also allows to view and define the properties of the images, GCPs, and output coordinate system. Process: This menu gives access to all processing options and actions. View: This menu gives access to the different views of the software. Depending on the selected view, a new item will appear on the Menu bar: Map, rayCloud,Volumes, Mosaic Editor or Index Calculator. This extra menu bar item contains options specific for the selected view. Gives access to the Manual, Support Site and Forum. Gives information about the installed release. The different options within the menu bar items may be active or grayed out depending on the status of the project and the selected options. The different buttons within the toolbar may be active or grayed out depending on the status of the project and the selected options. Each button's action can also be accessed through the Menu bar and is explained in more details in the next articles. Logged In as USERNAME: Displays the username. 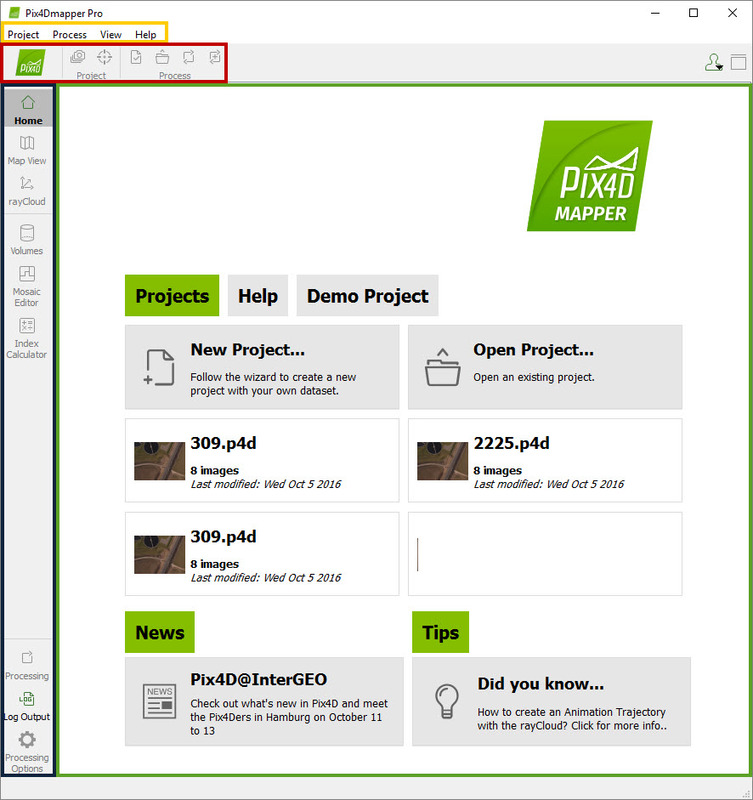 Cloud Projects: Opens the user website account, displaying the Projects page, where the user can access the uploaded projects (https://mapper.pix4d.com/projects/). 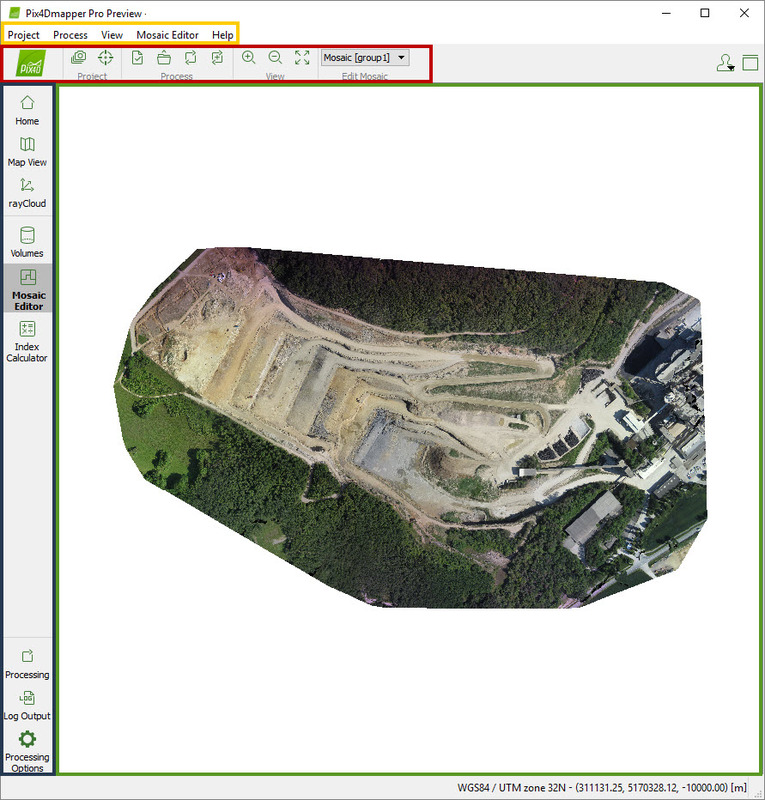 Manage Licenses: Opens the user website account, displaying the Licenses page, where the user can access the Licenses and Devices information (https://mapper.pix4d.com/licenses/). Log Out...: Option to deactivate the license in the installed computer. Show sidebar: Shows the sidebar on the right of the main window. The Home view and the Volumes do not have a right sidebar. Hide sidebar: Hides the sidebar on the right of the main window. The Home view and the Volumes do not have a right sidebar. When activating the different views using the View Menu bar item (Map View, rayCloud, Volumes, Mosaic Editor and Index Calculator) some extra buttons appear in the toolbar. These extra buttons are specific for the selected view (see Figures 2-6 below). Appears on the left of the main window and allows to select the view, bars (Processing and/or Log Output bar) and the Processing Options window. Depending on the status of the project and the selected options, the different options may be active or grayed out. When starting the software, only the Welcome View and the Log Output bar are active. In order to show / hide the view toolbar, on the Menu bar click View > Show View Toolbar. 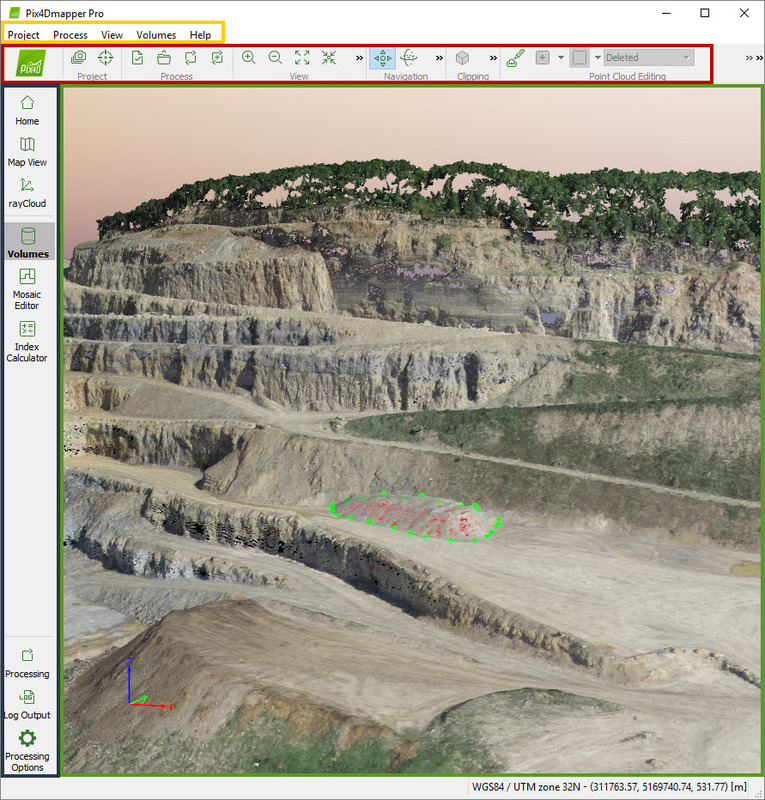 When Pix4Dmapper opens, the Welcome View appears. 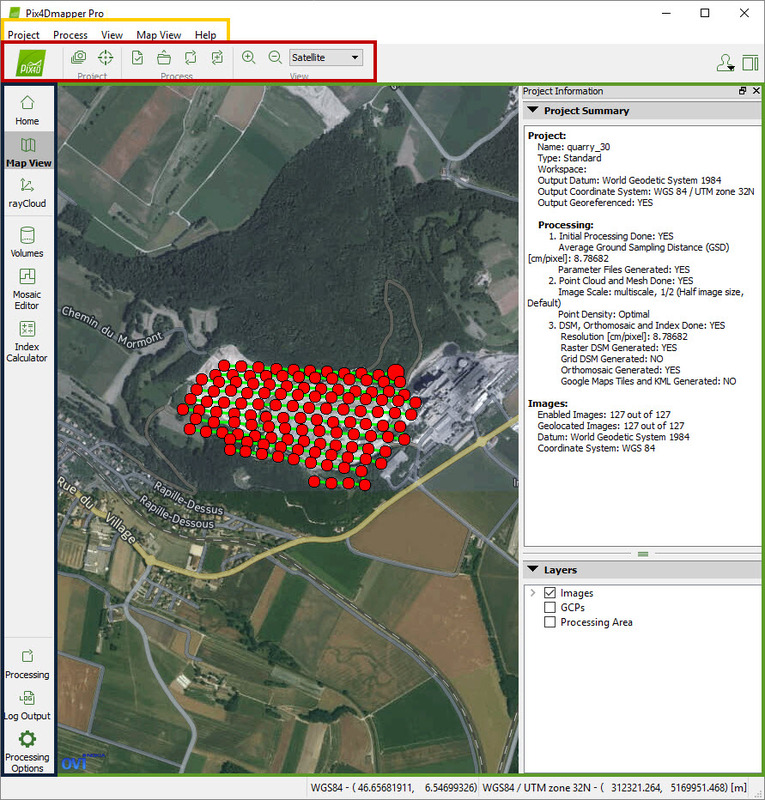 When opening a project the Map View is selected by default and the 2D View appears. 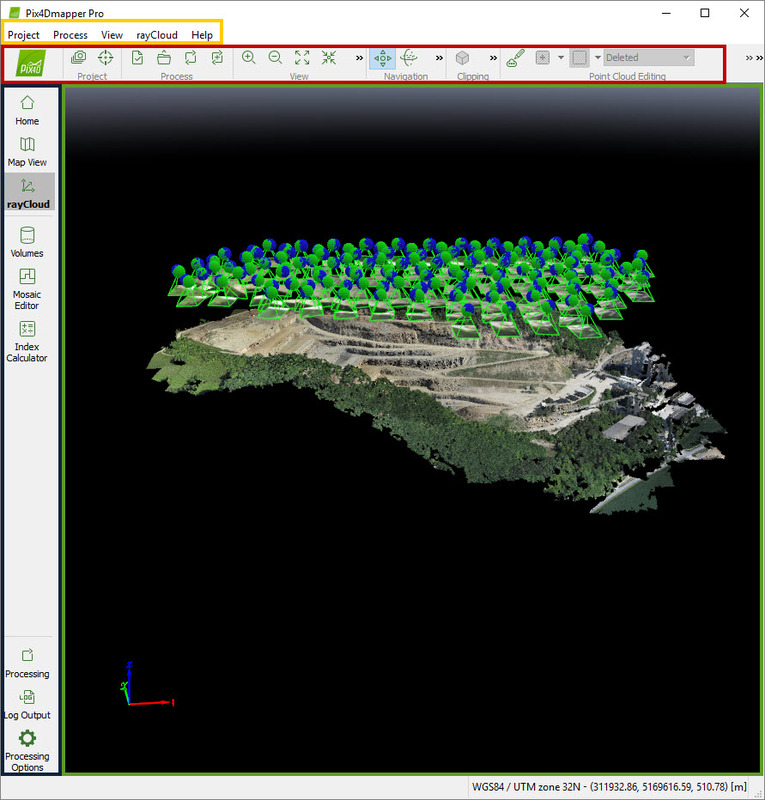 When the rayCloud or the Volumes are selected, the 3D View appears. When the Mosaic Editor is selected, the Mosaic View appears and when the Index Calculator is selected, the Index View appears. Figure 1. Menu bar, toolbar buttons, view toolbar and main view when starting the software. Figure 2. Menu bar, toolbar buttons, view toolbar and main view when the Map View is selected. Figure 3. Menu bar, toolbar buttons, view toolbar and main view when the rayCloud is selected. Figure 4. Menu bar, toolbar buttons, view toolbar and main view when the Volumes is selected. Figure 5. Menu bar, toolbar buttons, view toolbar and main view when the Mosaic Editor is selected. Figure 6. Menu bar, toolbar buttons, view toolbar and main view when the Index Calculator is selected.